We are very much sure how to prepare Beetroot curry, right...? I have made a slight variation on my own and have prepared the dish. 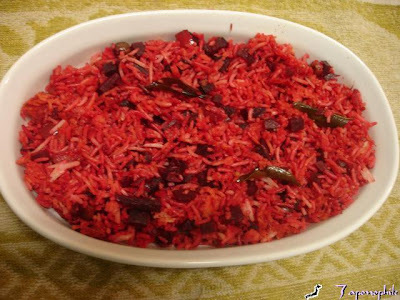 Beetroot rice is the one which will have a very good natural color, flavor and subtle sweetness. Heat little oil in the pan. Add mustard and let it splutter then add curry leaves. Add chopped onion and tomato anfd fry well. Add the grinded paste and fry well till the gingergarlic raw smell goes away. Add the peas, beetroot (grate if for kids or cut for adults)grated or chopped finely and fry well. To this add little salt just enough for the vegetable. Add little water (we need dry curry at the end) or sprinkle at regular interval and cook the vegetable. Once it is done add the cooked rice sprinkle the needed salt and mix well so that everything gets blended well.